Tuesday October 21 Pleasant & mild, Lena & I commenced cleaning out the two chambers in L, she doing most, & did the cleaning during the day. Mrs Howe & I went down town in A.M. & in to see Mrs Connor's "new goods", but hadn't come so went again in P.M. to "grand opening" had extra chores after getting home, but out again in eve to concert - by "Walters (?) of McGregor" with Ellery & Estelle. 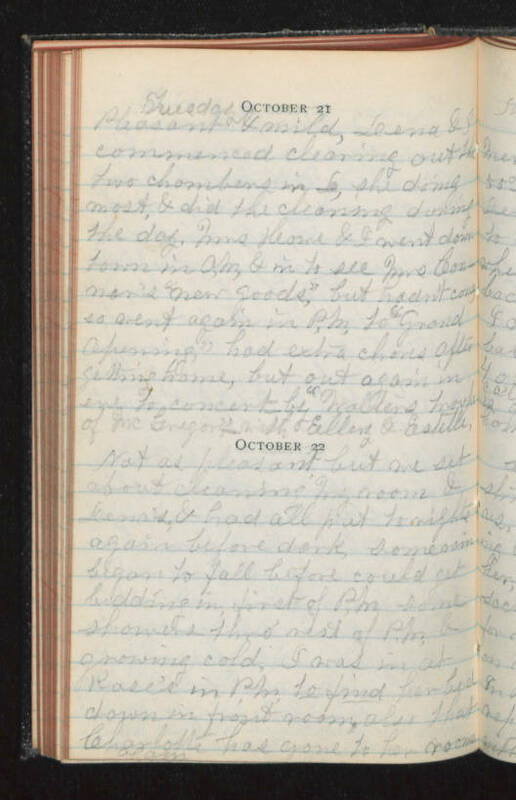 October 22 Not as pleasant but we set about cleaning my room & Lena's & had all put to rights again before dark, some rain began to fall before could get bedding in, first of P.M. some showers thro' rest of P.M. & growing cold, I was in at Rose's in P.M. to find her bed down in front room, also that Charlotte has gone to her room again.